The photographs are instantly recognizable, the name is not. Harry Benson, CBE, has created a vast repertoire of iconic images many will remember. Mr. Benson began his career in his home country of Scotland, capturing the hardscrabble existence in gritty black and white photographs. These photos, shot in the mid-fifties, are the visual overture to his new book, Harry Benson: Persons of Interest: Photographs That Defined an Era. From the fifties to the present, these photographs bear witness to the events and personalities that shaped the world. As Benson relates in the Introduction, “My first photograph was published when I was 17. . . . I gave the photo to the Glasgow Evening Times and waited and waited for it to appear. . . . I can’t remember if they paid me but seeing my photograph in print was what mattered. It still is.” Years and assignments later he would rendezvous with destiny. “In January 1964 came the call to go to Paris with the Beatles.” He would go on to become the photographer of the Beatles’ American tour. He went on to work under contract for LIFE magazine for thirty years, beginning in late 1967. The imprimatur of LIFE would grant him access to celebrities, politicians, protesters, tyrants, and fashion designers. 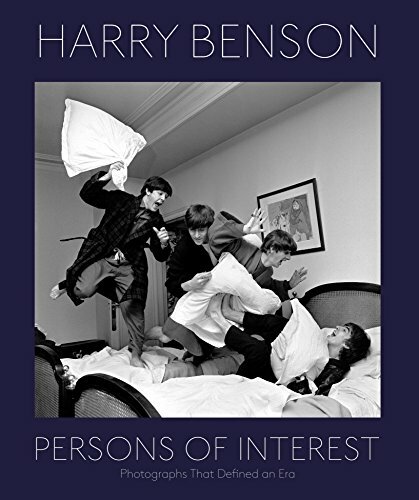 What Benson presents with Persons of Interest is a visual chronicle of the Baby Boomer Era. Like Billy Joel’s list in “We Didn’t Start the Fire,” the book presents one after another of striking iconic images. But Benson’s power lay beyond his familiarity with the rich and famous. The photographs, divided into chapters covering each decade, embrace the sublime and the mundane. Glossy fashion and celebrity photography commingle with war photography and photojournalism. Benson has photographed every sitting U.S. President since Eisenhower. For every iconic image there are hidden gems. He photographed Hugh Jackman with his age-appropriate wife. The photo gives Jackman and his wife, Deborra-Lee Furness, a casual intimacy. Hollywood has a tendency to turn people into idols and commodities. This photo gives the actor who has played Wolverine and P. T. Barnum a wonderful humanity. On the opposite end of the spectrum, Benson photographed President Ronald Reagan on his ranch. He imbues the former B-movie actor and governor of California with a rugged masculinity. Another president, George W. Bush, poses for a photograph with a “deer in the headlights” look. The list goes on and on. The Beatles clowning around with Muhammad Ali. A Klanswoman breastfeeding her child. The war-torn landscape of Afghanistan. One of the earliest images is of the newly crowned Queen Elizabeth II in coal miner’s garb preparing to inspect a mine. The black and white photograph, while documentary in nature at the time it was shot, now looks like a still from a science fiction movie. Persons of Interest is a big book in the literal sense. The oversize nature allows for extended engagement with the photographs. Iconic images are meant to be contemplated, analyzed, and dissected. Many with trigger memories and stories. For each photograph Benson provides a commentary. Since Benson has dealt with celebrities, politicians, and the powerful, these photos are not innocuous byproducts. Many are the result of choreographed and staged sessions. In any photograph a negotiation between three parties exists: the photographer, the subject, and the viewer. Does gazing at the photograph and reading its attendant text make the viewer a complicit party? Underneath a photo of Ivanka Trump Benson wrote, “The beautiful soon-to-be first daughter posed in her Trump Tower office on Fifth Avenue for the TIME magazine issue of the Republican Convention.” The rather insipid text runs beneath Ivanka’s glamour shot. Another aspect of photography is it denies the subject to speak. When it comes to images of Ivanka’s father, this can be a blessing or a curse. Beneath the smiling visage the viewer doesn’t get to hear the alleged populist’s verbal assault. Upon closer inspection, it isn’t only the Trump Tower penthouse that is gilt but not golden. Photographs can conceal as much as they reveal and Benson is the master at both. Persons of Interest offers a plethora of unforgettable photographs. From the fifties to the 21st century, Benson’s genius has been in capturing the moments and the people “that defined an era.” Everyone from celebrities to the everyday bystander have a place within these pages. As Hollywood and politics once again merge in the Oval Office, Benson’s impact on both worlds remain undisputed.